Since the January 12, 2010 earthquake that devastated Haiti, there has been a ripple effect within our community. Everyone was affected by this disaster in some way– losing loved ones in Haiti, worrying about how to support relatives and friends at home, struggling to plan for a future when so much is uncertain. This crisis has demanded that we come together. We have been fortunate to receive support from funders and hundreds of individual donors over the past few months. Your outpouring of generosity allowed us to maintain our programs in New York City, while collaborating with Lakou New York and MUDHA to provide solidarity relief on the ground in Port-au-Prince, Jacmel, and at an orphanage in Leogane, Haiti. Our immediate response to the earthquake focused on areas that were hardest hit and initially neglected by international aid groups. MUDHA purchased water, food, tents, and mattresses, and recruited medical professionals and student volunteers from the Dominican Republic, while we strengthened their efforts with donations of first aid/medical supplies, personal hygiene goods, and nutritional bars. Over the next two months, we made extended trips carrying several tons of supplies and arranging for more needed items to be shipped. These supplies were vital to MUDHA’s mobile medical clinics that serviced hundreds of families. We now send regular shipments with care packages for survivors who continue to live in tent camps or makeshift housing. 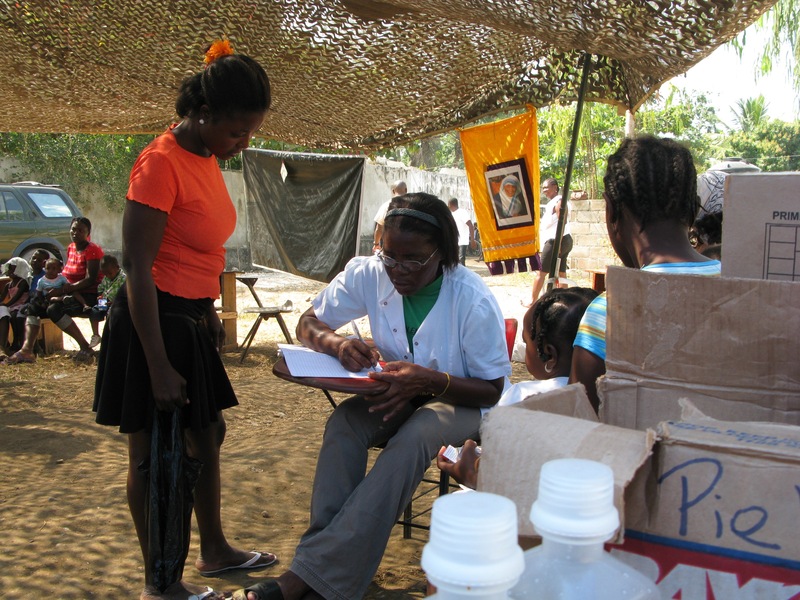 Our volunteers and staff participated in providing first aid, coordinating disease prevention trainings, and organizing cultural workshops that helped to heal and strengthen the spirits of the people. One of the major challenges people faced in the weeks following the earthquake was fighting the feeling of limbo, anxiety, and boredom because of the lack of activities. Schools were not operating, and most people were not able to work. 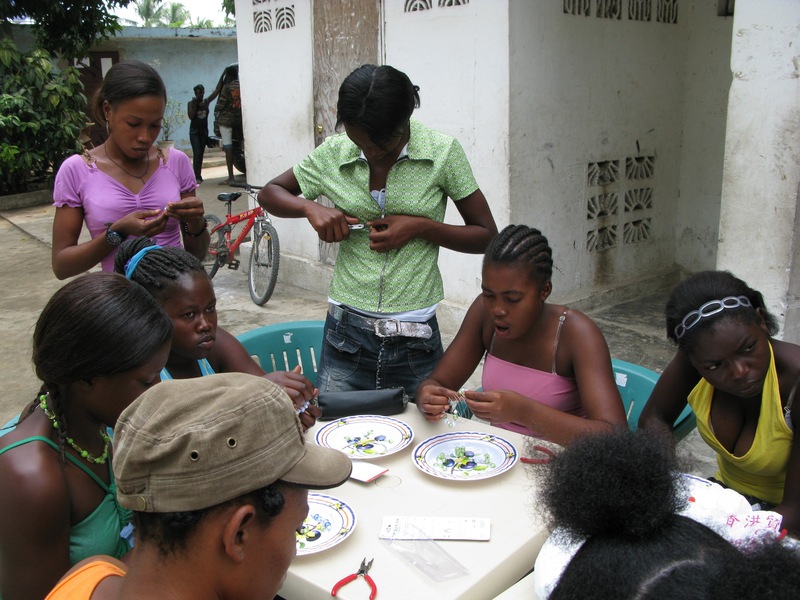 The jewelry workshops are extremely popular as a therapeutic activity where people can create original jewelry designs, to either keep or sell. 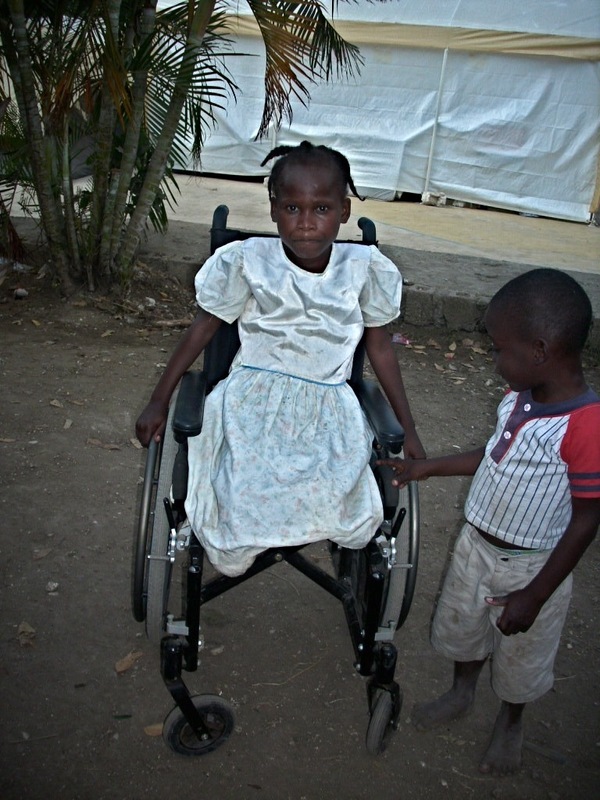 When we first arrived at the orphanage in Leogane, we learned about the story of Rose, a ten-year old girl who had been trapped by wall as she was trying to save a two-year old. The wall crushed her legs, and leaving doctors no choice but to amputate them. She is a strong girl with a lot of courage, and a wonderful sense of humor. Like many children in Haiti, Rose is an economic orphan whose parents cannot afford to care for her, although they visit and keep in touch. After meeting her, we did an appeal to the community through Lakou New York Radio in Brooklyn to get a wheelchair for her. We also researched how she could be fitted for prosthetics. HWHR’s executive director Ninaj Raoul connected with an American family who were familiar with the orphanage and had met Rose on a previous visit to Haiti. She is now staying with her sponsors and enjoying the ability to walk, swim, and attend school as she continues treatment for the next year. In the past several weeks, we have worked with cases of earthquake refugees in the New York area who were not as fortunate as Rose Michel. Many families coming to the US for medical care receive temporary assistance from relatives or local charities, but do not have a longterm place to stay or a way of supporting themselves. Once fitted for prosthetics, people with amputations often need several months of physical therapy, as well as emotional support to become mobile. The irregularities in US immigration policy have caused some of these cases to be classified as Humanitarian Parole, while many are simply on a Visitor’s Visa which only lasts a few months. We are helping our new clients obtain immigration advice from qualified lawyers, and apply for the services they may be entitled to. Some of our pre-existing clients have benefited from Temporary Protected Status offered to Haitians living in the US before the earthquake. We are keeping them informed about their rights as they apply for work authorization and other benefits. While clients who were previously undocumented appreciate the opportunity to work, many are worried about what will happen when the 18 month reprieve is over. We are looking for ways to advocate on behalf of these families, for policies that will allow them to remain in this country and find stability. We could not have continued to do this important work without your contributions. Thank you again, for your commitment to helping our community.